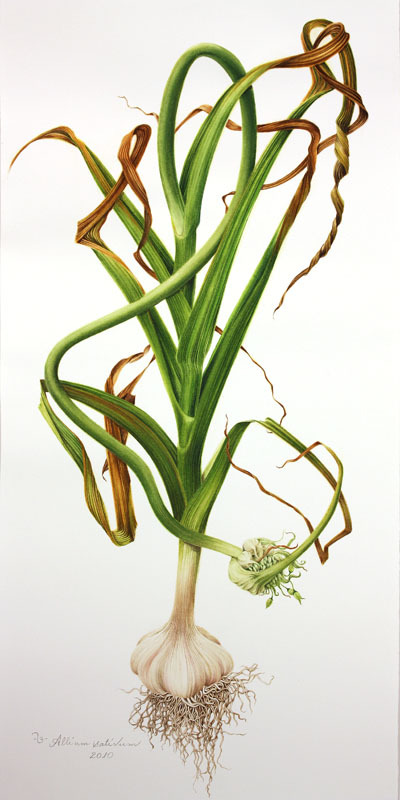 The genus Allium, from the Latin for garlic, includes several pungent bulbous plants—leeks, onions, chives. The garlic plant has a long folk history. Its use has been recorded in Vedic times, across cultures from ancient China to Egypt. It was believed to ward off diseases and infections and to confer strength. Garlic has had wide recognition for its fungicidal, germicidal, antiseptic and tonic uses wherever it is grown. The flowers, leaves, root and seed of the garlic are all edible, but it is the bulb which has been in longest use for its culinary, healthful and medicinal properties. And let’s not forget that garlic was also thought to repel evil spirits and vampires! I have painted leeks and onions and also garlic before, so admittedly I’m beguiled by the Allium family. To procure this particular specimen I had to request a local grower at our Farmers’ Market to save a plant with the scape & bulbil in tact and as much of the soil around the roots as she could. After several wasted trips (because the plants had not developed their eagerly awaited features) & weeks of impatience when I finally brought the plant home I immersed the bulb in water and very tenderly shook the soil away from the roots so they were uninjured by the trauma. Why all this fuss? Well, I have a strong aversion to roots being portrayed with abrupt endings—like a really bad haircut! Hence the couple of hours spent spraying and rinsing. There is real pleasure in taking a common kitchen staple and telling its story from its beginnings to tail ends, detailing the familiar and the less well known elements. The minuscule florets and the tiny garlic pearls at the end of the scape (the part that farmers dispose of so the bulb underground grows bigger and turns commercially viable), were a delight to behold and portray. I was riveted by the changing leaves that started off pliant in youthful shades of jade and emerald, drying gradually into coral and jasper; the bulbil breaking free of its turban shaped papery enclosure; the roots so thirsty when no longer earth-bound, exposed to air; the scape doing its sinuous serpentine dance to music inaudible to human ears. And just in case you were wondering, no vampires came calling! © 2010 – 2014, milly acharya. All rights reserved.